container available at Lowes or Home Depot. tape cord, also available at Lowes or Home Depot in the pipe section. around the tank to cover the most surface area. freezing and also keeps the clicker accessory from freezing as well. Takes very little power to run as it is thermostatic. the same reason and out of chicken reach. Hope the idea helps you all. heated options without any trial and error. waterer is good down into the teens. I know that you asked for people to post how they provide water during the winter months, but I can’t figure out how to post to your blog. Thanks. You won’t be able to post directly to the blog. 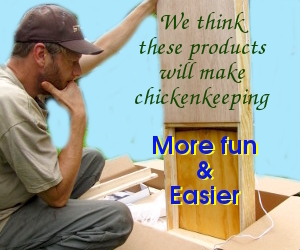 To enter the contest, follow the directions at http://avianaquamiser.com/posts/Heated__44___homemade_chicken_waterer_contest/ to email me your story and photos, and I’ll put it up on the blog for others to enjoy. Thanks!